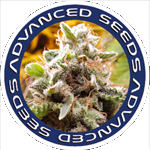 Advanced Seeds - Critical. Free US delivery. Critical is the plant for you if if you want massive flowers! Warning - the flowers can get so heavy with buds that the branches snap so make sure take extra care with the plant when it begins to bud! Critical produces an has an incredible Aroma and is known for its intense effects. This genetics are a combo of Critical Mass x Brazilian x South Indian!